Strange pop music explode in a small tatami room! He is unconventional solo artist in underground....singin',shoutin' and rhymin' by Japanese poetry! This is...experimental,funk,rock,pop,newwave,folk,electro,hiphop.......JUNK HOP! Itsuro writes the lyrical verse in the word of thorough Japan. The content of the expression of the poetry looks like the act that becomes desperate and starts gripping the one not seen. And, his music is expressed with various music forms. We can feel his memory concerning the traditional Japanese music, and the influence of various foreign music. - prince,tom waits,mikami kan,happy end,terence trent d'arby,beck,sonic youth,daniel johnston,michael jackson,terayama shuji,kurosawa akira,woody allen,Jean-Luc Godard,Michelangelo Antonioni,dazai osamu,nakahara chuya,Dostoevskii,Viktor Pelevin,etc.- . 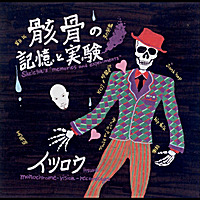 'Skeleton's"Memories and experiments"'is an experimental rock music, and can called avant-garde hip hop, too. It is very strange pop album. And, this album is honesty itself. self-portrait full of scratches sublimes to entertainment. I want a lot of people to listen by all means.